Introduction: Parthenium hysterophorus has become a huge problem throughout the world and is menacingly threatening the agriculture and environment. The existing methods for controlling or eradicating P. hysterophorus weed have their own limitations, that is, physical methods are very laborious, costly and ineffective in long term; chemical methods are costly and less environmental friendly and biological methods are not appropriate on large scale. The compost from Parthenium weed can be prepared to recycle the nutrients that are sucked by undesired weed from the soil. Presently, the available methods take a long time in preparing Parthenium compost, while the shorter methods are mostly less ecofriendly. In the present work, a method and recipe have been developed for preparing compost of Parthenium weed in comparatively less time (60 days only) and that too, in an ecofriendly manner; and it has been named as Vishishta composting. The term ‘Vishishta’ is a Hindi word, which means ‘something special’. Materials and Methods: In the present experiment, Parthenium weed was composted using rock phosphate, Trichoderma viride fungi culture powder and different organic wastes such as cow dung, sawdust, cow dung ash, dried fallen leaves and wheat straw in a duration of 60 days using the method of Vishishta composting. Results: The P. hysterophorus compost contains more nitrogen, phosphorus and potassium and other nutrients than farmyard manure. Overall status of the nutrients as-prepared compost is appreciable. Conclusion: In the present experiment, a method and recipe have been developed for composting Parthenium weed in shortest duration as compared to earlier methods available till date. Weeds are defined in many ways, but the most common definition is: ’A weed is a plant that in a given situation is more detrimental to agriculture than beneficial’. Parthenium hysterophorus L. is a fast maturing annual weed, which is spreading throughout the world. It belongs to the family Asteraceae and it is commonly called Parthenium weed, congress weed, carrot weed, the scourge of India, false ragweed or white top and has become a major weed in Australia, Africa and many other parts of the world. It is an annual herb and erect up to 1 m in height; the stem is branched and covered with trichomes with a deep-penetrating taproot system and an erect shoot system. Parthenium has originated as a result of natural hybridization between P. confertum and P. bipinnatifidum. The plant was accidentally introduced in India along with food grains imported under PL-480 (Public Law 480 passed in 1954 to give food grains to developing countries). Narwal has discussed the chemical analysis of P. hysterophorus and it has indicated that all the plant parts including trichomes and pollen contain several secondary metabolites such as alkaloids, parthenin, kaempferol and caffeic acid, being high in leaves followed by inflorescence, fruit, root and stem. Parthenium weed not only competes with crops and pasture species but it has also been reported as a health hazard to human beings and livestock. The sesquiterpene lactones, namely parthenin and coronopilin present in the trichomes of leaves and stems of Parthenium, are responsible for causing various allergies like contact dermatitis, hay fever, asthma and bronchitis in human beings., Ranade reported that pollen of this weed was the main cause for eczemoid dermatitis. It is also a significant threat to the viability of natural agro-ecosystems throughout the world., P. hysterophorus causes a decline in the yield of up to 40% in agricultural crops. Because of the presence of active ingredient of Parthenium, parthenin livestock is also allergic and susceptible to P. hysterophorus. Close contact of animal with P. hysterophorus may cause rashes on the whole body and udders. Parthenin is quickly degraded with a half life (DT50) of 59 h in soil. Parthenium is a prolific seed producer and a fully grown plant, which can produce more than 15,000 seeds in its lifetime. Its seeds are mainly dispersed through water currents, animals and the movement of vehicles, machinery, livestock, grain, stock feed and other produce, and to a lesser extent by the wind. Parthenium grows luxuriantly in fallow land, rock crevices, city waste-dumped areas, road sides, railway tracks, orchards, construction sites, forestlands, agricultural areas, shrublands, urban areas and overgrazed pastures. Among various causes of its rapid spread, lack of natural enemies of this weed is perhaps the most important one. For controlling the weed in many areas, it is burnt after being allowing it to get dried. Burning is not promoted as a control strategy for Parthenium weed. In our opinion, burning the weed will destroy the valuable nutrients that are taken by the weed instead of the desired crop and polluting the environment as well. Frankly speaking, there should be a strategy through which, these valuable nutrients may be recycled and again reach to the desired crop. An experiment by Kumar and Kumar also discourage about it. They suggested that after ploughing, P. hysterophorus should not be burned in the agricultural field as P. hysterophorus ash reduces overall productivity of P. moongo. Chemical control is a quick and effective option for the management of P. hysterophorus. A range of herbicides have been tried for this purpose, out of which glyphosate, atrazine, dicamba, 2, 4-D, picloram, 2, 4-D ester isoproturon and metribuzin were found promising. Even if various chemicals control the weeds effectively in time, its continuous use causes the pollution hazards in the eco-systems and it is not economically feasible as well. The chemical fertilizers and pesticides not only polluted the environment but also increased hazards of problematic weeds such as P. hysterophorus, Celosia argentea, Cynodon dactylon and Eichhornia. It calls for reversion of present chemical-based soil fertility management strategy to the one based on integrated nutrient management strategy. Therefore, weed management strategy needs to be shifted towards non-chemical methods. Parthenium weed can be suppressed by growing competitive crops such as fodder sorghum sunflower and maize or self-perpetuating competitive plant species such as Cassia tora, which will compete with the weed and thus reducing its population. The leaf-feeding beetle Zygogramma bicolorata and the stem-galling moth Epiblema strenuana are widely used to manage Parthenium. Z. bicolorata is now widely used in India to control it. The root and shoot extracts of some allelopathic grasses also reduced germination and suppressed early seedling growth of exotic weed P. hysterophorus L.
It is the preferred metabolic pathway for organic matter decomposition in aerobic conditions. The P. hysterophorus compost contains two times more nitrogen, phosphorus and potassium than farmyard manure (FYM)., Jelin and Dhanarajan revealed that the combination of Parthenium and sawdust in composting takes relatively shorter time for degradation for preparing good quality compost. Compost of Parthenium weed was also prepared by Ameta et al. ; they used cow dung, rock phosphate and Trichoderma viride fungi culture powder in addition with the weed for composting it. Its effect on seed germination and survival of radish (Raphanus sativus) was also observed. These results were found worthwhile, but it took a longer time of 6–7 months in the preparation of compost. In the present work, Parthenium was used as a source of composting to make it suitable for agriculture and providing a better way of eradicating it. However, this field requires an extensive study for the development of a strategy for composting of Parthenium weed, which is not only ecofriendly but also cost effective, less laborious and can give compost in shorter duration. Composting of the weed may give us comprehensive benefits such as control of weed population, reduced use of chemical fertilizers, giving nutrients back to the desired crop that are sucked by the weed and last but not least, in an environmental friendly way, which is quite necessary in the present scenario. Parthenium was collected from Kurabad, a township in Udaipur district of Rajasthan, India, during summer. Rock phosphate and T. viride fungus culture powder were procured from a Private Organization in Udaipur, Rajasthan. Sawdust, cow dung ash, dried fallen leaves, wheat straw and cow dung were collected locally and a digital thermometer with probe was used for monitoring the temperature. The collected Parthenium plants were cut into small pieces having a maximum size less than 2.5 cm. Then, it was kept in plastic bags for 2–3 days and placed in sunlight. When these were opened for composting process, the materials were hot enough. The total quantity of the materials used for the formation of the compost is given in [Table 1]. Sawdust was used in this experiment because it has been assumed that it traps heat better within the pile because of its insulating properties and also, it is a good source of carbon, thus providing a balance to the required C/N ratio. Wheat straw and dry fallen leaves were also used as a good source of carbon for maintaining the required C/N ratio in the process. Likewise, other organic wastes such as cow dung and cow dung ash, were used so that the waste could be utilized and more balanced compost could be prepared. A wooden box of size 90 cm × 90 cm × 90 cm was prepared [Figure 1] and used as a bin for composting. Many holes were made on all the four sides of the box providing a proper passage of air in the box. The base and upper parts of the box were kept hollow so that it can be easily detached from the material while turning is provided to the material; and also one can perform the work of two bins from one box only. Therefore, it would be economic also. A base of the plastic cover was made and the box was placed over it. All the collected materials such as Parthenium weed, sawdust, rock phosphate, cow dung ash, dried fallen leaves, wheat straw and T. viride fungi culture powder were mixed in the desired proportions and placed in the bin. A solution of cow dung was prepared using water. It was sprinkled timely on the material during filling material in the bin so as to provide appropriate moisture content. Then, the box was covered with a plastic cover for protecting it from intense sun light, rain as well as from predators. This material was kept undisturbed for 3 days. Only water was sprinkled in it in desired quantity to make optimum moisture content during this phase. Temperature was monitored regularly in the pile and it was found to be around 65°C on the 3rd day, which is optimum for composting process. Hence, it was decided to turn the material so that it could be protected from overheating. Therefore, after 3 days, the first turning was provided to the material. 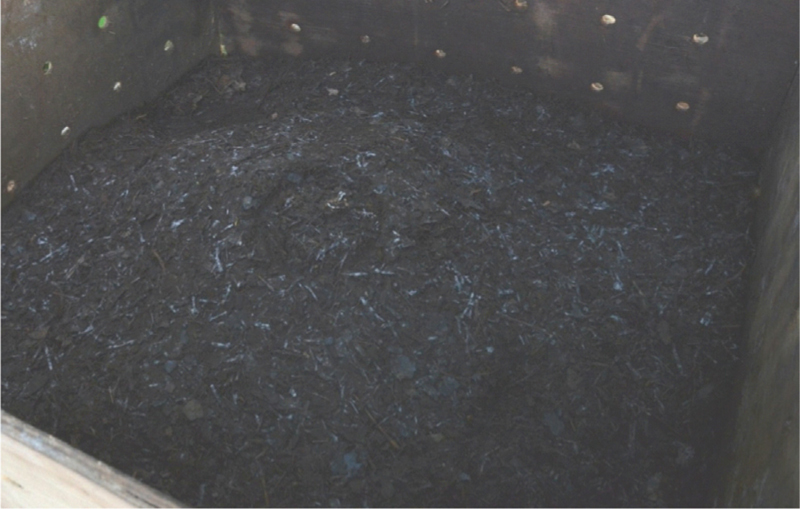 While turning the material in the pile, some positive signs of composting were observed, such as the material was dark in colour, it was too hot and some fumes were visible even with naked eyes. Everything was found perfect, for example moisture, temperature as well as the smell of the material in the pile. Turning was provided to the material regularly on alternate days for 1 month. After 1 month, the frequency of turning was reduced because at that time, the optimum temperature was not achieved during turning on an interval of a day. Hence, only 4–5 turnings were provided in the next month with an interval of 7–8 days. It reduced the labour and also provided the desired optimum temperature. A total of 16–17 turnings were provided in the whole process in 2 months for composting Parthenium weed with other organic wastes, rock phosphate and T. viride. Water was sprinkled regularly for maintaining moisture content in the pile. A few days after initial turnings, a white fungal appearance was also seen [Figure 2] on turning the compost, which may be a possible cause of degradation of feedstock in shorter duration. Thus, 60% of the feedstock is obtained as compost in 60 days through Vishishta composting. 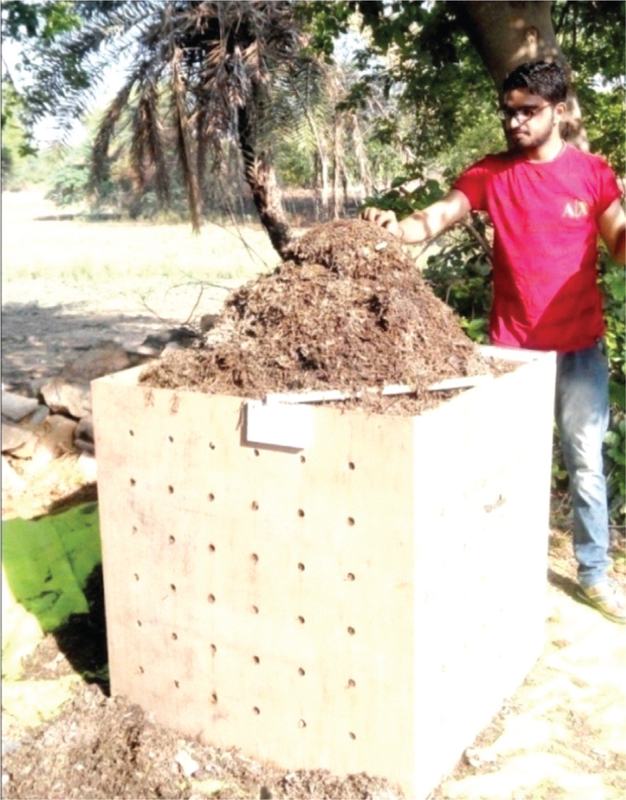 Quantity of the compost prepared by this method was also greater than other methods.When composting process was completed, sampling of the compost was done. Compost was brought outside the pit and it was mixed well for sampling. Fifteen to 20 samples were taken from different places and mixed well. The mixed sample was collected and spread in a disc-like shape and divided into four equal parts. Samples in opposite quarters (any one set) were discarded. Then, the remaining two quarters of the compost sample were mixed thoroughly. The process was repeated till the sample size was reduced to 0.5–1.0 kg. This exercise was repeated thrice and three samples were prepared. Then, 13 physico-chemical parameters were analyzed in each sample. An average of three observations was taken. The suitability of the method was also tested in destroying the weed seeds in the as-prepared compost. The compost was spread in the field and wheat crop was sown. Germination of wheat seeds was observed. Generally, the temperature generated during composting process destroys most of the weed seeds and pathogen. While composting weeds, it is necessary that the method should be suitable for destroying the weed seeds during the process of composting, so that the weeds are not spread on application of compost. Parthenium weed was composted in an environmental friendly way within a duration of 2 months only. Impact of this compost on germination of wheat crop was found to be good [Figure 3]. When the compost was applied in the field to the desired crops, no Parthenium plant germination was seen there and that is a good sign indicating that Parthenium seeds were destroyed during the composting process. Variations in temperature of the compost pile were monitored throughout the process and it ranged between 37°C and 65.30°C. The optimum temperature required for composting process is 60°C to 65°C and it was maintained most of the days in this process. When the pile obtained the optimum temperature, frequent turnings were provided so that the pile could be protected from overheating. When turning did not heat the pile again, it was assumed that compost is prepared. At the end of the composting process, temperature of the pile was almost equal to benign environment. 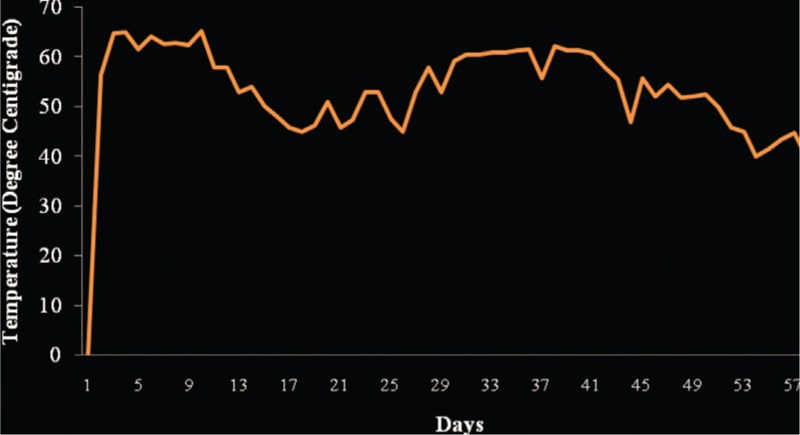 Graphical presentation of temperature in the compost pile during 60 days of Vishishta composting is shown in [Figure 4]. The physico-chemical parameters of the prepared compost, in particular the NPK contents, were compared with FYM and it was found that the nitrogen content was almost three times greater and other nutrients were also found in significant amount in the as-prepared compost and it is a positive sign for the quality of compost. On an average, a well-decomposed FYM contains 0.5% N, 0.2% phosphorus and 0.5% potassium only. 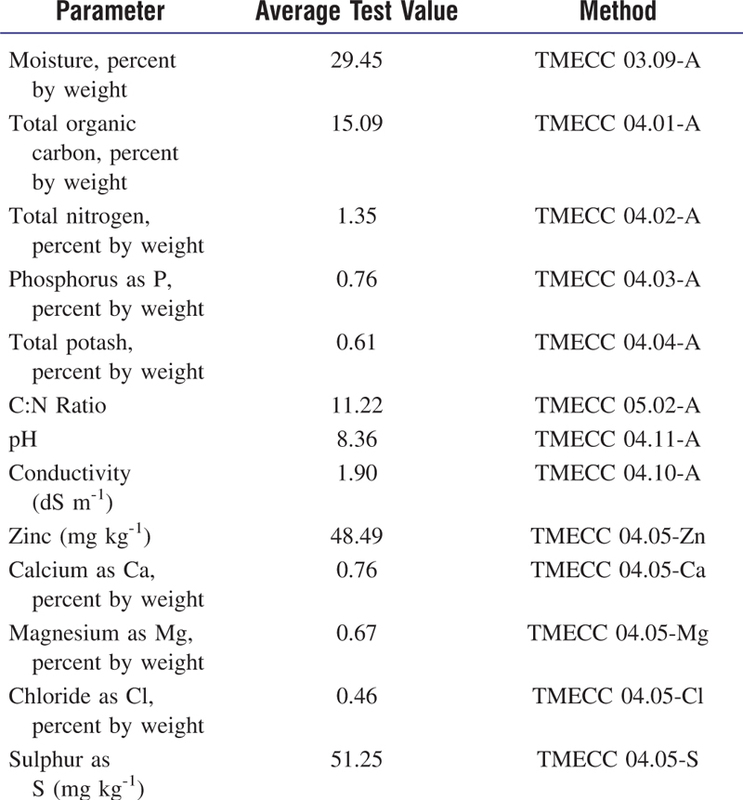 Some physico-chemical parameters in the prepared compost have been analyzed and the results are reported in [Table 2]. In the present scenario, everyone is talking about using the things, which are environment friendly for maintaining long-term sustainability of our planet Earth. Nowadays, many areas are already facing lack of availability of adequate food supply because of extreme population pressure and imbalanced weather phenomenon. Weeds are also contributing in all these and thus, enhancing this problematic status. Therefore, such weeds need to be properly managed. In the present experiment, Parthenium weed was composted in an environmental friendly way within 2 months only. The nutritional status of the as-prepared compost is also satisfactory as compared to other manures as it has 2–3 times more nitrogen than FYM. 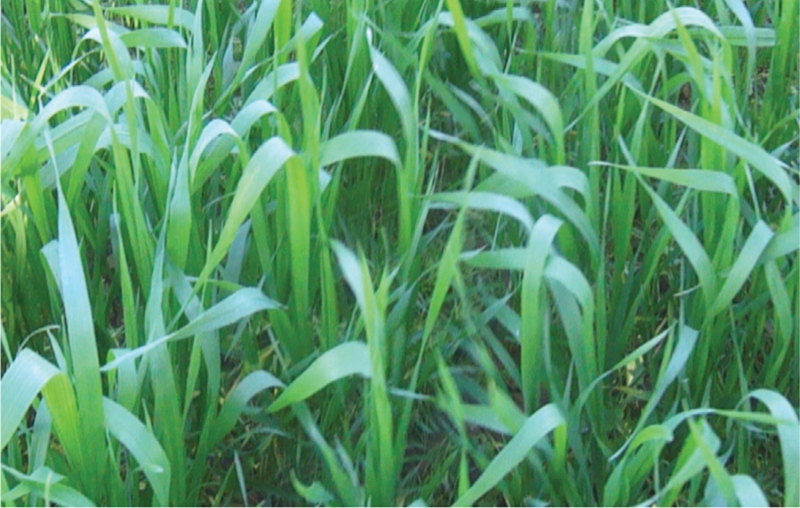 Impact of the compost on germination of wheat crop was also good. When the compost was applied to the field to the desired crops, no Parthenium plant germination was seen there; it is a good sign that Parthenium seeds were destroyed during the process. Thus, an ecofriendly method and recipe have been developed for composting Parthenium weed, with the addition of different organic wastes in shortest duration as compared to earlier methods available till today. We thank Prof. B.R. Bamniya, Late Prof. O.P. Ameta, Prof. Nidhi Rai, Dr. Devendra Singh Rathore, Dr. Anuya Verma and Ms. Pallavi Gothalkar for critical discussions during the progress of work. We are also thankful to Mr. Lokesh Chandra Ameta, Mr. Umesh Chandra Ameta, Mr. Navneet Audichya and Mr. Parashram Lohar for their assistance and support. Arnon I. Agriculture in Dry Lands: Principles and Practice. Amsterdam: Elsevier; 2012. p. 789. Adkins SW, Navie SC, Graham GC, McFadyen RE. Parthenium weed in Australia: Research underway at the CRC for tropical pest management. In: Mahadeveppa M, Patil VC, editors. 1st International Conference on Parthenium Weed Management, vol I, University of Agricultural Sciences, Dharwad, India, 1997. p. 13-7. Nath R. Parthenium hysterophorus L. − A review. Agric Rev 1988; 9:171-9. Narwal SS. Allelopathy in Crop Production. Jodhpur, India: Scientific Publishers; 1994. p. 288. Devi YN, Dutta BK, Sagolshemcha R, Singh NI. Allelopathic effect of Parthenium hysterophorus L. on growth and productivity of Zea mays L. and its phytochemical screening. Int J Curr Microbiol Appl Sci 2014; 3:837-46. Wiesner M, Taye T, Hoffmann A, Wilfried P, Buettner P, Buettner C et al. Impact of the pan-tropical weed Parthenium hysterophorus L. on human health in Ethiopia. Utilization of Diversity in Land Use Systems: Sustainable and Organic Approaches to Meet Human Needs, Tropentag, Witzenhausen, October 09-11, 2007. Kapoor RT. Awareness related survey of an invasive alien weed, Parthenium hysterophorus L. in Gautam Budh Nagar district, Uttar Pradesh, India. J Agric Technol 2012; 8:1129-40. Ranade S. Results of newly synthesized vaccine in cases of congress eczema in India. Paper Read at Aswin Naval Bose Hospital, Bombay, 1975. Adkins SW, Navie SC. Parthenium weed: A potential major weed for agro ecosystems in Pakistan. Pak J Weed Sci Res 2006; 12:19-23. Khosla SN, Sobti SN. Effective control of Parthenium hysterophorus L. Pesticides 1981; 15:18-9. Rodriguez E. Chemistry and distribution of sesquiterpene lactones and flavenoids in Parthenium (compositae): Systemic and ecological implication (Ph.D. Thesis). University of Texas at Austin; 1975. Kushwaha VB, Maurya S. Biological utilities of Parthenium hysterophorus. J Appl Nat Sci 2012; 4:137-43. Belz RG, van der Laan M, Reinhardt CF, Hurle K. Soil degradation of parthenin − Does it contradict the role of allelopathy in the invasive weed Parthenium hysterophorus L. J Chem Ecol 2009;35:1137-50. Dhileepan K, Strathie L. Parthenium hysterophorus L. (Asteraceae). Cambridge University Press; 2009. p. 274-318. Singh S, Yadav A, Balyan RS, Malik RK, Singh M. Control of Ragweed Parthenium (Parthenium hysterophorus) and associated weeds. Weed Technol 2004; 18:658-64. Javaid A, Shafique S, Bajwa R, Shafique S. Biological control of noxious alien weed Parthenium hysterophorus L. in Pakistan. Int J Biol Biotechnol 2006; 3:721-4. Kumar M, Kumar S. Effect of Parthenium hysterophorus ash on growth and biomass of Phaseolus mungo. Acad Arena 2010; 2:98-102. Wahab S. Management of Parthenium through an integrated approach initiatives, achievements and research opportunities in India. Proceedings of the 2nd International Conference on Parthenium Management, University of Agricultural Sciences, Bangalore, India, 2005. p. 36–43. Kumari M. Parthenium hysterophorus L.: A noxious and rapidly spreading weed of India. J Chem Biol Phys Sci 2014; 4:1620-8. Dhileepan K. Effectiveness of introduced biocontrol insects on the weed Parthenium hysterophorus (Asteraceae) in Australia. Bull Entomol Res 2001; 91:167-76. Javaid A, Anjum T. Control of Parthenium hysterophorus L., by aqueous extracts of allelopathic grasses. Pak J Bot 2006; 38:139-45. Anbalagan M, Manivannan S. Assessment of impact of invasive weed Parthenium hysterophorus L. mixed with organic supplements on growth and reproduction preference of Lampito mauritii (Kinberg) through vermitechnology. Int J Environ Biol 2012; 2:88-91. Jelin J, Dhanarajan MS. Comparative physicochemical analysis of degrading Parthenium (Parthenium hysterophorus) and saw dust by a new approach to accelerate the composting rate. Int J Chem Environ Biol Sci 2013; 1:535-7. Channappagoudar BB, Biradar NR, Patil JB, Gasimani CA. Utilization of weed biomass as an organic source in sorghum. Karnataka J Agric Sci 2007; 20:245-8. Angiras NN. International Parthenium Research News, vol 1; 2008. www.iprng.org. Ameta SK, Ameta R, Dave D, Ameta SC. An approach for bringing nutrients back into soil by composting weed Parthenium. Sky J Soil Sci Environ Manag 2016; 5:52-8. Ameta SK, Sharma S, Ameta R, Ameta SC. Effect of compost of Parthenium hysterophorus on seed germination and survival of Radish (Raphanus sativus): A comparative study. Int J Bioassays 2015; 4:4325-8. Basarkar UG, Kshirsagar GS, Saoji AA. Comparative study of vermicompost using Parthenium biodung and usual green biodung. Int J Bioassays 2013; 2:819-24. Thompson WH, Leege PB, Millner PD, Watson ME. Test Methods for the Examination of Composting and Compost. Washington: Composting Council; 2001.